Fr. 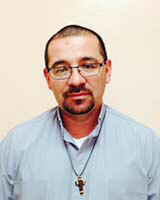 Luis Antonio Diaz Lamus is the General Counselor of the Congregation to the Missionaries of St. Charles, Scalabrinians, and a Director of SIMN. Fr. Luis worked with Latin American, Italian and Brazilian migrants in several communities in New York. He also assisted migrants in the field of vocational education and training in Colombia. Since November 2012, he has served as the General Counselor of the Scalabrinian Congregation. Fr. Luis obtained his bachelor’s in Philosophy at St. Bonaventure University in Bogota, Colombia; his bachelor’s in Theology at the Pontifical University of St. Thomas (the Angelicum) in Rome; and his master’s in Spiritual Theology at the Pontifical Gregorian University, also in Rome.